First of all, people think it's cheaper to have a Slave when it's totally the opposite. 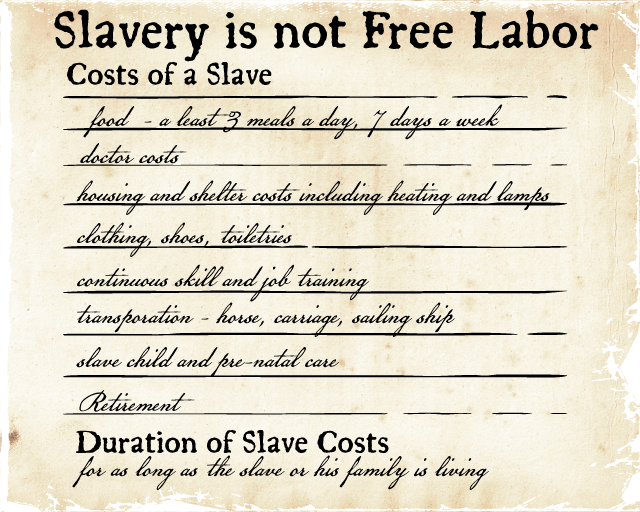 The Slave Master has to pay for everything the slave needs to survive and be in good working health. A least 3 meals a day, 7 days a week, all health care, all housing, transportation, slave child care, prenatal care, plantation security, and skill training. Next, the Master has to worry about the crops in the field to feed everyone. If you think about it, who really is the Slave here as the Master has to provide every single thing for his family and the slave's family to survive. Who really is figuratively "oppressed" as the Master has to provide everything and worry about enemies from foreign countries to native Indians to drought, disease, famine, and insects and the list goes on and on. This not to mention getting the best price for his crops to pay for all his costs and his slaves' costs. Back then, Africans did not speak English and so someone had to teach them how to speak English....from scratch. That's not easy to do. Isn't it true that there is drawing, painting of a slave standing on some pedestal of being "auctioned" off in New Orleans? And the reason the highest bidder paid the highest price for a slave was because the strength and health of the slave, correct? And if that is true, the reason why the master would pay such a high price was because he wanted the slave to work on his plantation doing all sorts of farm work? Correct? Hence, If there is an incentive to BID MORE for a healthy and strong slave, why isn't there a financial incentive to make sure the slave is treated properly like a race horse? One could wager that the master treated the slave like a prized race horse and made sure that slave was as healthy as possible as those slaves are the work horses of the plantation. And if the work horses of the plantations are sick or injured, the amount of food could be significantly less and result in severe food rationing and partial starvation. Aside, the Masters and Slaves on a Plantation had more mutual respect for each other as both of their lives and familes depended upon each other daily to produce food. This in comparison to the American Ghettos and Inner City Public Schools of today where many inner city public schools are 99% Black. Lastly, the Master is like the quarterback and coach of the plantation. That master had to know a lot about farming back then. If not, they, the master's family and the slaves families could starve to death as they didn't have MRE's, bottled water, TV dinners, running water, plastics, garden hoses for irrigation, electricity, cars, 911, welfare, food stamps, SNAP or super markets back then.